Hi! I'm welcoming you to join the first unofficial real world map expansion for Project Zomboid! Now in blindcoder's PZ Map project! Radcliff is a small city in the outskirts of Elisabethtown and south of the impassable Fort Knox. Despite the rural prerequisite, the city center's slow streets and small boulevards are surprisingly alive. Just east of Radcliff lies the small town of Vine Grove, which can be described just as quaint and quiet. These lovely suburbs are the home of few and hold a place for those seeking a rural setting with a steady pace. Installation directions: just extract the files in your %username%/zomboid/mods -folder and enable the mod from the pz mods options window (you might have to restart the game). As many of us know the developers have been hard at work with the mapping and Mash is pounding away in secrecy and deciding what will be the next big things added to the map. Also much hasn't been confirmed about how big the map will actually be and what it will eventually cover. We have had word that the map will be expanded, and some rumors that we'll likely see the impassable Fort Knox and the swarming city of Louisville implemented in the future. That is all we know. This project is here with that knowledge to be added south of the future Fort Knox and maybe even work as an encouragement for Mash and TIS on their great work. So, what is this about? I am creating (with hopefully some help ) a 10x10 cell map with accurate (as close to real life size and placing, as I have the fortitude) road mapping, forests, rivers, railways, paths and buildings of the town of Radcliff which is south of Fort Knox. Why are you doing this? Because, I love Project Zomboid and the community and wish to help make this the best zombie survival game it already is! 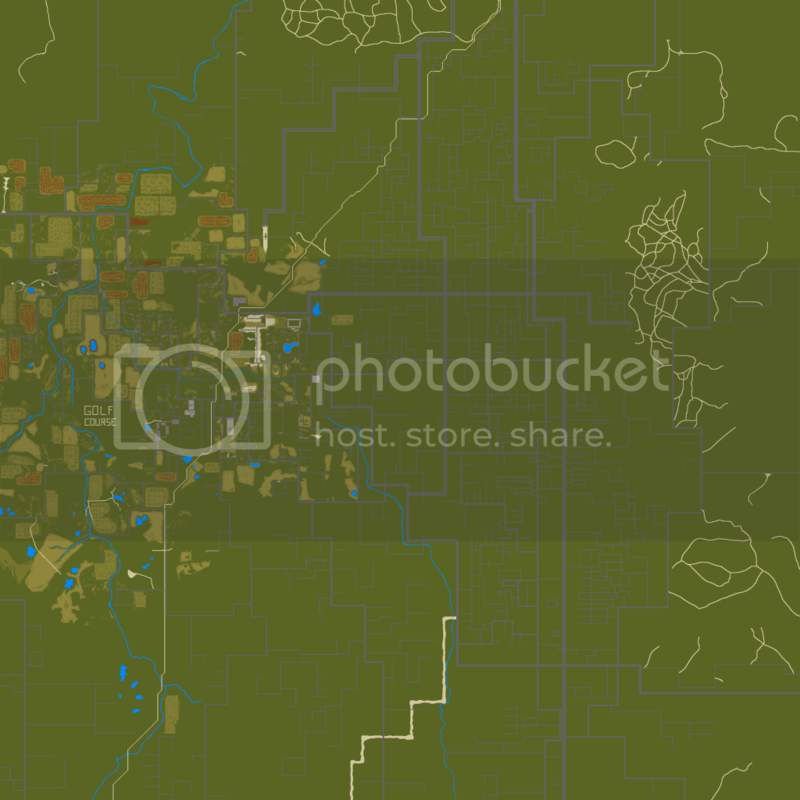 Also I have been doing a fairly large project on my own which includes my home city, but I have decided to put it on the background for a while and do something where the whole community will benefit. As to the purpose of this map, it is to be as good as (or even better ) than the original, existing map, expanding the playable area enormously and maybe even be incorporated to the vanilla map when it is fully fledged out. Only TIS knows! When will this be out? I wan't to play! I'm sorry to say that this being such a huge and intricate project, you're going to have to wait quite a while until it will be in any fully playable state. As in the Indie Stone fashion: No ETAs! That being said the ones contributing most can of course always make test versions for themselves and with agreement, share some versions with friends and others for testing/streaming etc. purposes. Once we get there I will publish larger alpha/beta tests for the public, but I'll say that as I'm quite the perfectionist, the map should be very much near completion at that point. Mainly this is a slow and steady project and I'm in no rush of finishing it tomorrow or the day after. Questions, comments, ideas? Post them below or PM me personally, but as always keep it civil, constructive and lovely, above all! Here's the first picture of the map when I finished with making the roads. I've made the base map from a mash of google map screenshots and tilted them slightly. This is, because of the roads being only possible to draw in two directions. Also the original Muldraugh map is slightly tilted so it should fit right in. 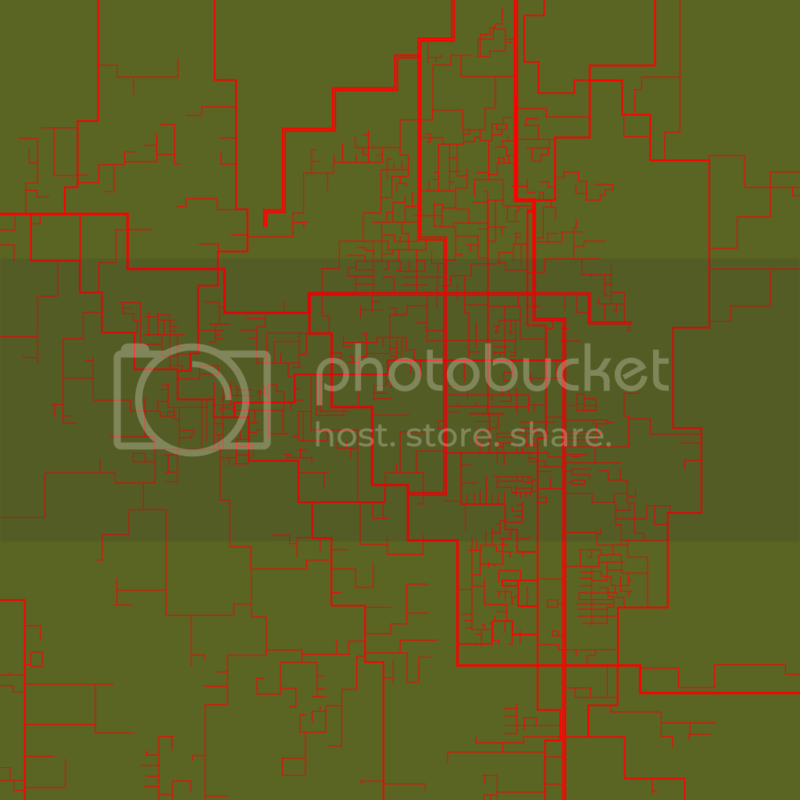 the roads are highlighted as red so you can see how well it corresponds with the RL roads. If you don't agree with some of the choices I've made in this or have good ideas on how to improve them, please post below or PM me. Note this is not the finished road map and some minor changes have already been made to it. The largest roads are 14px wide without and 12px (6px/direction=2lanes/dir) with a mid gap, medium roads are 9px, small 2way roads 6px. 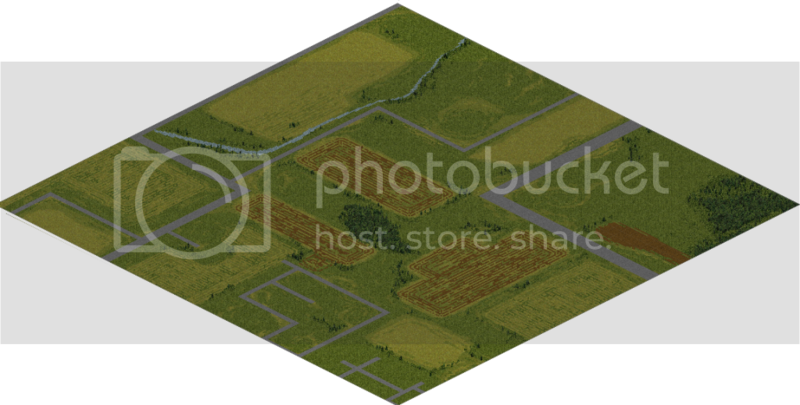 and the driveways / small country roads are 3px (I might increase some to 4px depending on your views). Here's what I call a "finished" cell. The mapping is complete and it looks fairly good on the WorldEd. This is a point where I'll start adding buildings to the area and adding more detailed vegetation. This, as the topic says, is a representation of what the most typical of the houses look like in the Radcliff area and around it. Small white buildings are the most common. Also many of the buildings have some sorts of garages or shelters for cars. These are what the map will need the most and is what should be done first, as I've started the finishing on the west side of the map and they are most abundant there. Here's the full size png of the roads, rivers, fields etc in the area. It is still heavily WIP and should be treated as such. (for example I accidentally marked the railway in the middle as sand road ) As you see I'm starting to get finished on the left side of the screen which has a lot of fields and especially empty areas, which seem to be the hardest to pull off looking good in game. Here you can see how the forests, bushes and grass will be laid in the map. I've tried to correspond the forests with the real world ones as closely as I can, but due to the squareness of the roads I've had to take some liberties to keep my sanity. Again the left side is more finished and detailed atm. I will try to make this map as accurate as possible before moving into the tilezed editing. This will not be the finished vegetation since the buildings etc. will require further editing when I can see exactly how they fit in with the map. Here's the plan for now. I will start finishing cells the png and _veg maps and once satisfied with a few, I will start adding my own made buildings and those that you've sent. After we've gotten a few cells roughly finished we'll start testing and fixing those cells while adding more, slowly. We're aiming for near flawless execution and things like wrong spawn in container etc. shouldn't happen. This is a point where we'll be needing some closed testers to tell what's going on with the maps. After that, slowly expand until we've covered most of the cells and are pretty stable, with hopefully no walkthrough walls, accurate loot etc. This is the point where the first test maps will be released for the full public as a beta release. Cross your fingers. And please be lovely towards me/us . At the same time as I assume Mash is fully at work with new areas and therefore new tilesets, we'll do some needed upgrading and correspond to feedback accordingly. Lastly after extensive tweaking, drawing, building, releasing and re-releasing we'll release the final version on the mapping section. I'll somewhat try to keep up on the stuff as it gets finished and update it here whenever I have some extra time. I would like to recieve all your buildings preferably via PM as to not clog up the topic, but I won't mind if you prefer to post them here. Your initials followed by _RC_ building type _ size _ and number of the building in mentioned type and size category. This helps me to keep the files organized, follow where I've placed them and help with debugging. We now have a working team of 5 members! Yayy! Pridelost (buildings) Check out his awesome map project Dreadwood! Sieben (buildings) Sieben's got some great buildings going on in here. More than sieben! DoctahWong (buildings) He has a nice lil' variety of buildings here. Special thanks for the whole TIS crew for making a project like this at all possible and such an enjoyable waste use of free time! What tilesize should tiny, small, medium, etc be? Gratulation for the map! Looks great (after seeing the roadmap I were blinded )! Thanks. I've made the small buildings around 10-20 tiles and 1-2 small bedrooms so tiny would be anything smaller than that. Maybe up to 30 or 20 and two storys for the medium and so on. Use your own judgement within reason. It isn't that specific, just that you keep consistent with your choices. There aren't many limited room squares in the map so it doesn't restrict the size that much. The scope of this project is epic. I wish you the best with your project, the map looks really great. Thanks Pridelost. If you have time, please do chip in. You've got some great things going on with Dreadwood! I would love this to be more a community project above all else! Not just my project. EDIT: Just did a first run on the map testing, and I'll just say it's freakin' huge! This is a map that needs cars. The houses are really scattered and there's just a feeling of hopelesness that comes to mind. This is the town that you drive by when your car brakes in the middle of nowhere, when you're trying to get to the city. Then you're either stuck at the farm or start walking the mile. I know you've requested a lot of houses but if you need anything more specific I'd be happy to do something for this. Community projects are great. 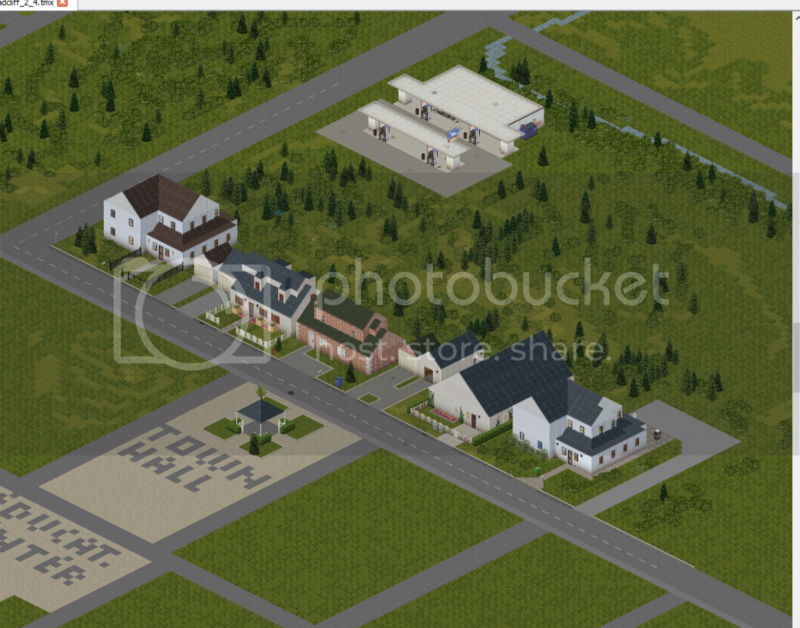 To be honest Dreadwood started with my modeling my house, then my supermarket, then I had a nice little town. Thanks for the comment too, I value any feedback. Allright! We have our first official member, Clarkimedes! Who will be doing some buildings for the east side of the map for starters. Yayy!! @Pridelost: When I get more focused on the buildings etc. I'll let you know if there's something nice n' specific for you! Suomiboi, I am gonna help you with buildings (or other stuff) etc, sign me up! go on with what we've got so far. You could also talk with Clarkimedes on what he's done so far and maybe plan a little so you won't do the same stuff accidentally. I'll PM you later. Where should I send the houses? PM me. Any file sharing site is ok. If you have lots of files I'd prefer something sort of zip/archive. OK, so far it's only one house, but tomorrow I have plently more time. I'll make a pack and then upload it. This map is going to be hard. Imagine yourself walking down few cells to get a can opener. That's why I love it. I'll chip in with buildings too. What is your process for creating empty farm fields? If you want I have been working on a program where you designate the area you want to be a field and it automagically fieldifys it. Yea I saw that and was just about to ask about it, but I got cold feet and decided to use a secret method of copy paste and some erratic paint brushing. Thanks for the offer, but I've made a system that fits my needs for now! EDIT: although I could check it out... no harm there! Just send me any image you want farmified. The parts you want turned into farms should all be the same color. It looks best if you round off corners and make borders a little wavey. Update: We've got a small team of 4 now going on and we're starting to get our first finished building packs to be added for the map. I've also finished 5 additional cells in the mapping, so that's ten out of a hundred! We've now got thanks to our members and contributors, a total of 31 different buildings, including train hulls, a grain silo, garages and a whole bunch of different sized homes! A lot is still needed though and we've only scratched the surface, so keep 'em coming! I've updated the OP for more accurate descriptions/amounts on finished items. Y'know, i could give you my replica of the Muldraugh Barn and Chicken Coop so you don't have to work on it... thing is... i don't even know what to add inside the chicken coop, heh... and the Barn is just filled with crates. Send 'em in! I'll see if there's a place I can put them on the map. If you, or anyone, has something specific they'd like to do in the vine grove neighborhood you're more than welcome to PM me to see if they've been done. Also as a public announcement I'm gonna need a approximately 20x20 tile gas station with a small building in it and a 6-12x10-20 tile long pub with white wooden walls and a ridge roof. Thanks! I want to take part in this project! Just tell me where to sign up and what I need to help with! 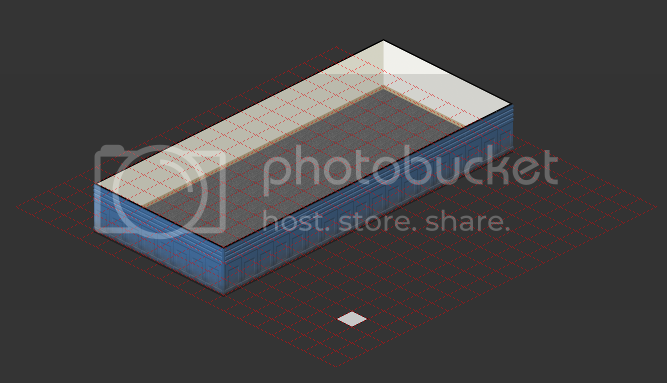 ... a 6-12x10-20 tile long pub with white wooden walls and a ridge roof. Thanks! What shape? Kind of this? door to the south, but you had the roof right. 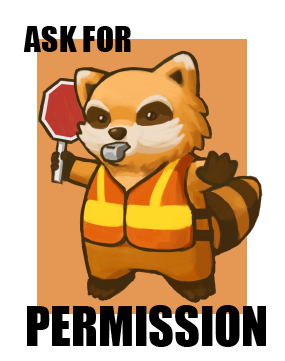 Good, slightly early Mondoid, people! I'm here with a small update and a teaser picture for you guys! First let's amp up the building count! We now have a whopping 75 buildings! The new buildings include a gas station, A baseball field! lots of tiny, small and medium sized homes and a quaint little gazebo. Thanks to all who have contributed so far! The mapping has gone slightly slower due to mainly me drinking too much in the weekend and suffering from that subsequently. Regardless, I've finished 3 new cells and started plotting some buildings into the world map. I've also made a small description for the map for when it will be put in the world. I've included that in the beginning of the OP. Check it out and tell me what you think. I've updated the png and _veg maps in the OP so check 'em out! Also as before I've tried to put the accurate amounts of the buildings (some might be missing, I'm a bit tired now ). Here's the pic as promised!